Lisa Rosenthal (left) and Melanie Ziemnik (right) outside of Kogod on Melanie's graduation day. 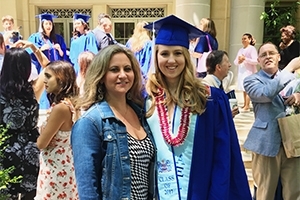 Since 2016, Kogod alumna Melanie Ziemnik, BSBA '17, has worked under alumna Lisa Rosenthal, MBA '01, owner of Mayvin, formerly the Mayvin Consulting Group, a company dedicated to national security consulting that serves military personnel. The women met two years ago when Rosenthal was a judge in the Kogod Case Competition and Melanie was a competition student. The Case Competition is an annual event in which student teams present solutions to an issue a company faces. The competition requires months of preparation, and can help students develop skills in case analysis, leadership and teamwork, while also providing valuable networking opportunities. "I thought Melanie stole the show with her composure," Rosenthal says. She offered Ziemnik an internship opportunity on the spot, but didn't go easy on her in the interview. "I was horribly mean to her," Rosenthal jokes. There was a method to her madness. It was important to gauge whether, despite Ziemnik being new to the working world, she could be prepared for the tough, male-dominated environment at Mayvin. "Lisa definitely [wants to make sure] you're someone who can take a rigorous work environment," says Ziemnik. "It's not about the knowledge you have," Lisa agrees, "it's about the mindset you have coming into this office." Another one of Ziemnik's mentors at work is a former Navy Seal. A majority of her working hours are spent traveling around the world with him, visiting war zones and seeing the direct impact of their work. "That's one of the more incredible things about what we do," Ziemnik adds. "Even though we're sitting here in our office in Northern Virginia, we still get to see how we fit into the life cycle of [a military operation]. It helps motivate you every single day." "I love what we do, because our job is to help bring the soldier back safely," Rosenthal says. "How do we change the way we fight, how do we ensure national security? Our job is to save lives." Both Rosenthal and Ziemnik emphasize they wouldn't have been prepared for such a job without Kogod's focus on real-world learning. "It's one of the things I love about Kogod," Ziemnik says. "It was the mindset of, 'here are real, impactful ways you can go out and start affecting meaningful change. That very much helped me transition into a professional life." "Something that is great in theory has to be great in execution," Rosenthal agrees. "Kogod does that better than any of the other schools in the area. The professors have real world experience, not just academic." After completing an internship and working part-time during her senior year, Ziemnik is now a business account development manager at Mayvin, where her responsibilities include developing proposals, creating non-disclosure agreements, expanding social media efforts, and participating in financial analysis, among other tasks. She spearheads projects and undergoes constant training to improve the skills and knowledge that will help her build her future. "I am taking every day one at a time," she says. "That's one of the great things about this job. Every single day looks different." Both women know that someday, in the not-too-distant future, Ziemnik's place of business will look different, too. "My job isn't to keep someone here past their expiration date," Rosenthal says. "My job is to grow the next generation, to have them go out and make a difference. It's not about keeping her in one place-it's making sure she gets the opportunity to grow. I am so proud watching her develop into this professional woman. She went from being a college kid, within a year, to walking into NASA headquarters and having conversations about how we can help them become a better organization." Learn more about American University's Kogod School of Business and their undergraduate and graduate programs.